Over time we have had people inquiring us regarding the life of our copper bathtubs and whether do they come with any warranty. This post aims to answer and clarify their doubts by using a time-tested and world-renowned Copper Durability Test – The Titanic Explanation. Although buried deep down in the Atlantic Ocean for more than 100 years, the copper, brass and bronze treasures still being unearthed from the RMS Titanic have become a beautiful and intriguing part of the ship’s lasting legacy. Over the course of 8 expeditions beginning in 1987, divers have uncovered more than 5,500 artifacts from the ship which tragically sank on April 15, 1912, about 350 miles off the coast of Newfoundland, Canada. Since then, these unearthed pieces have been viewed by more than 25 million visitors at traveling exhibitions and museums worldwide. These 25 million visitors have witnessed the strength of copper, brass and bronze artifacts which are still intact despite sitting in the salt water for over 100 years. Bill Sauder serves as the director of research for RMS Titanic, Inc., a subsidiary of Premier Exhibitions, Inc. based in Atlanta, Georgia, which has led the expeditions and exhibitions of the Titanic. Sauder also assisted in set and dialogue efforts with the making of James Cameron’s epic 1997 film known as Titanic, which has since then led to him working as a consultant for documentaries on the ship’s history. His help with the film involved offering insights on script wording for the lower deck scenes as well as and cluing the filmmakers in on what décor and paint schemes would be authentic to the ship and those running it. Sauder notes that an astonishing 25 percent of the rescued materials from the site where the ship sank is made from either copper, brass or bronze. Artifacts in harsher environments in the deep of the seawater are more likely to disintegrate and become incredibly fragile if any remnants are left, Sauder notes. But thankfully, in many instances, Sauder says copper alloy artifacts are often brought up looking like they came right off of an assembly line, once the pieces are properly treated in desalination tanks. This is true of some gold-plated chandeliers brought up from the ship’s wreckage site. 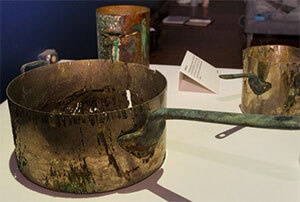 “In some cases, the artifacts do come up in pristine condition,” Sauder notes of copper alloys. “The mud down there is very acidic, so something is more likely to survive if it falls on something else.” An exception is when an artifact falls onto a piece of iron, in which case it is permeated by the tendency to corrode more quickly, as is the case for the iron. Deck benches on the RMS Titanic were made from bronze to help avoid the issue of corrosion, so these seats are a larger-sized artifact retrieved from low in the waters of the Atlantic. “Practical items like cooking pots were made from copper in the time of RMS Titanic,” Sauder says, pointing out that the metal was a favorable choice also because of its heat conductivity on a cooking surface. 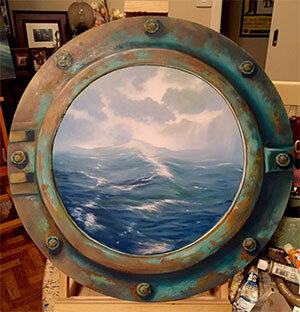 And porthole frames from the outer structure of the ship, made of bronze, are a part of the traveling exhibits today in gratitude of their durability despite sitting in the salt water for so long. Sauder even traveled to England several years ago to meet the grandson of the man who made the original Portholes-Thomas Utley. He used this trip to supplement his research and understanding of the history and design of the RMS Titanic. Three of the ship’s bells and several steering wheel stands, crafted from bronze, were brought up to join the exhibits, too. An interesting factor is how pieces made out of copper alloy, attached to wood, helped to preserve small portions of wood on the ship due to the chemical makeup of copper’s properties and durability. This sometimes involved sconces with the wood paneling it was screwed into at a wall area. Bronze letters, about one to two inches tall, were saved from the RMS Titanic, spelling out the words C DECK, but K is missing from the original lettering. 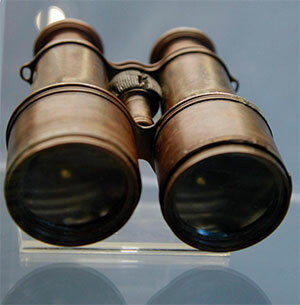 Six sets of spun brass binoculars owned by passengers on the ship were also found in the wreckage. Sauder notes that these are not the more famous ones missing and originally issued to the crew members. 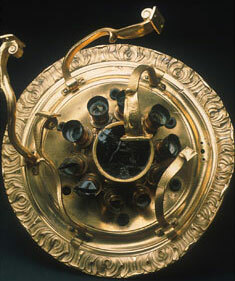 Some of the smallest artifacts Sauder mentions are brass mechanisms from watches and clocks. 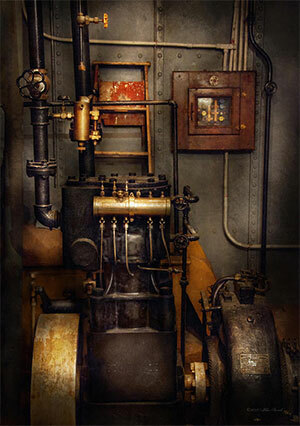 But brass screws and doorknobs are also something sourced from the ship in the dozens range. Button-hooks from shoes are often what really strike exhibit visitors, strongly affecting their emotions as these reminders make them understand just how real this tragedy was more than a century ago. An unexpected piece Sauder has documented from the ship is a copper repoussé tea tray heading to the U.S. as the personal property of a passenger. He describes the tray as taking on an avant-garde style in the persuasion of arts and crafts, steering away from designs of Victorian formalism still so dominating at the time, which made it stand apart very powerfully amid the other artifacts brought up from the water. “Some of the nicest things from the ship tend to be instruments,” Sauder says. An instrument called an engine indicator, which measures horsepower and produced a diagram to be filed and stored away, was built from mostly brass and had a needle moving back and forth across it with an agitator. This article is the best testimony of strength and warranty of artifacts made of copper, brass and bronze. So if you are looking for a bathroom or kitchen fixture that you would want to last for generations then Coppersmith Creations is the one stop destination for you where we offer copper bathtubs, copper sinks, copper kitchen sinks, brass bathtubs, cast bronze sinks, copper beverage tubs etc. P.S. If you have any design specification for anything that you would like to be built of these durable metals like, copper, brass & bronze then please get in touch with us. Chances are that we might be able to help you out.